There are two reasons I enjoy attending mineral symposia. One is that the social events and activities that surround such events give me a chance to enjoy friends who have come from all over the world. The October Yale Mineral and Gem Symposium is like that. 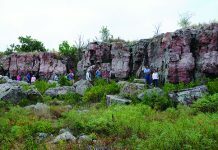 The second reason—and the main purpose of any symposium—is that it provides a venue for experts in various fields of mineralogy to share their latest finds and adventures with an interested audience. 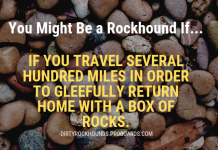 The Dallas Mineral Collecting Symposium is a prime example of this. Held each year in late August, the Dallas symposium features lectures by a group of eight experts. Some of them report on far-off localities that are currently producing collector specimens. Some of these adventurers have gone into deepest Africa or to the highest peaks of the Himalayas to find fine specimens. Other speakers talk about their lab research and findings, while providing insights into how minerals are related one to another. My On the Rocks column in this issue is a quick look back at the 2017 Dallas event. Both these symposia have featured outstanding people. One person I have heard at both events is Harrison Schmitt, the Apollo 17 geologist-astronaut who studied moon rocks. His lectures are always informative and inspiring. I always come away from both these symposia having learned more about minerals and localities. One of the 2017 Dallas symposium lectures I really enjoyed was given by George Rossman (www.gps.caltech.edu/content/george-r-rossman), who is among my favorite mineral researchers on one of my favorite topics: the causes of color in minerals. Rossman is an expert on the topic. He teaches a variety of scientific subjects at the California Institute of Technology, Pasadena, where he carries on his research into mineral colors using the latest scientific instruments. 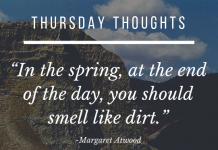 I have been following his writings on the subject for a couple of decades. Scientists have discovered several reasons for the colors in minerals. Some scientists list as many as 13 different causes of color, but the great majority fall into one of several main categories: the physical structure of the mineral; trace impurities within the atomic structure of the mineral; and missing electrons in the mineral’s atoms. Currently, there are more than 5,000 known mineral species, a large percentage of which exhibit color. Rossman reports that at least 40% of known minerals with color owe their hues to trace amounts of a handful of metal ions acting as coloring agents, or chromophores. These are called the “transition metal elements”. On the periodic table, the elements are divided into groups, or families (columns), and periods (rows), while a block identifies elements that have the same atomic orbital type (https://en.wikipedia.org/wiki/Periodic_table#Grouping_methods). The s-block contains the first two groups on the left side of the table and helium, at the top right; the p-block consists of the six groups on the far right of the table, excluding helium; and the f-block contains the inner transition metals. The transition metal elements are grouped together in the d-block. On most published tables, there is a dark line that splits the p-block diagonally, starting on the left side of the element boron (5) and zigzagging down to the right, ending between polonium (84) and astatine (85). Running along this dividing line are the elements we call semimetals because they have some metal and some nonmetal properties. Semiconductors like silicon get their name from this group. Below and to the left of the zigzag line are the metal elements. Above and to the right side of the marker are the nonmetals, which show few—if any—metallic properties. period on the chart. They are vanadium, chromium, manganese, iron, cobalt, nickel and copper. Some of the rare earth elements and uranium sometimes act as chromophores, but these seven transition metal elements are the leading causes of color in minerals and are the most active chromophore elements. What distinguishes such color-causing elements from other elements is their ability to absorb certain light wavelengths and reflect others. They can throw normally white light out of balance so that one or more colors become visible. The transition metals’ electrons use the absorbed light energy to change their position within the atomic structure of the mineral. This is called a “crystal field transition”. Only certain electrons in a mineral are involved in causing color. The atoms of each element have a set number of electrons, determined by the number of protons, that orbit the proton-rich nucleus. These electrons, in most cases, have a set arrangement. For example, oxygen’s electrons are in two orbitals, with two in the first and six in the second. A heavier and more complex metal element is molybdenum (42). Its 42 electrons are arranged in five orbitals, 2-8-18-13-1. If you look at the oribital arrangement of the transition metal elements named above, you’ll see that they have fewer orbitals. The heaviest one, copper (29), has an orbital arrangement of 2-8-18-1. The key is that, in transition metal elements, the electrons in the next lower orbital can—if supplied with light energy—shift to the higher orbital. This throws the energy in light out of balance, as mentioned earlier. Keep in mind that white light is a balance of all visible wavelengths, which tend to cancel each other out, so the light has no color. We get to see all those colors only when light is refracted, for example, by striking an oily surface or by passing through a glass prism or a mist of water droplets. Dispersion separates the wavelengths into the color spectrum as a rainbow. Colors result from the different wavelengths of light energy. Blue and violet light waves are shorter and higher in energy. Red wavelengths have lower energy and a longer wavelength. When the sun sets, the atmosphere absorbs or scatters the shorter wavelengths of light at the blue end of the spectrum, but the longer red waves make it through the atmosphere, producing a beautiful orange to red sunset! The same thing happens when normal, colorless light passes through a crystal that has no chromophore impurities in it. The light waves are unaffected, so the crystal is colorless because the light’s wavelengths remain in balance. If a trace of an iron chromophore were to replace some of the quartz’s atoms, we might see the nice yellow color of citrine. Most quartz has some aluminum in it, but not enough to directly affect any color seen. Remember, too, that iron can have two, three, or even four electrons in its outer orbital. If the iron atoms have two electrons in the outer orbital, they can create citrine. But if the iron atoms have four electrons in their outer orbital, the quartz crystal takes on the color violet. The four electrons in iron’s outer orbital have resulted from background radiation and are rather unstable. 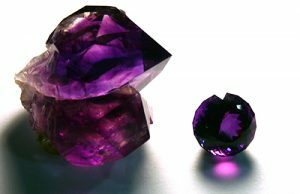 Any powerful light, like sunlight, can put those electrons back where they belong, and the lovely violet color of your amethyst can fade, eventually becoming colorless. 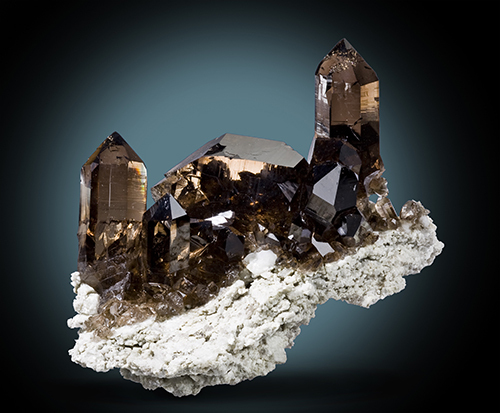 How about smoky quartz, a color center mineral? In this case, a greater amount of aluminum has gotten into the quartz structure, replacing some of the silicon atoms. That’s a very common occurrence, since quartz often forms with feldspar, which is based on aluminum. An additional problem is background radiation where the quartz has formed. Over much time, the radiation slowly displaces some of the electrons in the quartz structure. When light energy enters the quartz, some of it is absorbed by these displaced electrons and the crystal appears smoky to black. Many crystals that have color because of displacement—including topaz, fluorite and amethyst—will lose their color if they are exposed to strong light. Topaz, fluorite, amethyst and others do this and are grouped under the heading of “color center” minerals. The intense color of amethyst is due to radioactivity knocking electrons out of position. The color can be lost. chromium as an impurity in its aluminum oxide structure. Those chromium atoms have taken the place of a few aluminum atoms. When light energy strikes the ruby crystal, the chromium’s electrons absorb some of the blue light energy. This puts the light out of balance, with the red wavelengths made more dominant. This is what imparts the red shade we admire to the ruby crystal! Not all elements have electrons that can absorb energy and change position. 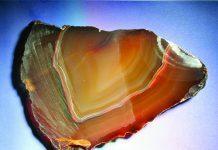 Their colors can be due to inclusions of another mineral, like the bits of copper in glassy, artificial goldstone. One colorful mineral that even noncollectors are familiar with is lovely, blue-green amazonite. 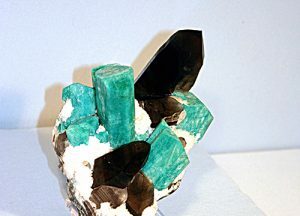 Wonderful examples of amazonite have been seen on TV, thanks to the mining work of the Joe Dorris family in Colorado. Amazonite, a colorful variety of the feldspar microcline, is common in the mountains west of Colorado Springs. Early studies show that its color is due to something unusual: water and lead atoms, aided by uranium. Water’s molecule is usually H/2O (two hydrogen atoms coupled with one oxygen atom). If we write its formula as HOH, you can see that it contains the hydroxide radical (OH), which makes it more chemically active. Color that is caused by missing electrons is easily lost if the specimen is exposed to a high level of energy, such as heat or strong light. Research into what causes color in minerals is ongoing, as many colorful minerals have not yet been studied. It takes special equipment, lots of time, and a dedicated and curious scientist like George Rossman to continue the search for causes of color in minerals. Hopefully, we’ll hear the results of that work at a future symposium. If you are interested in reading more about Rossman’s research, search the internet for him with the key words “George Rossman, Cal Tech”. 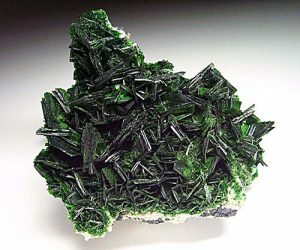 He has written and co-authored an amazing number of scientific papers, abstracts, and research papers on a very broad number of mineral subjects, including color in minerals. Holds the Carnegie Mineralogical Award, is a member of the Rockhound Hall of Fame, and has been writing for Rock & Gem since its inception. 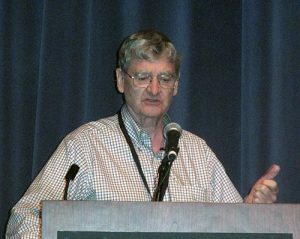 He lectures about minerals, and has written several books and video scripts.